The Igloo Legend 2 Gallon Drink Dispenser accommodates cold liquids and incorporates a friction lid for easy opening and closing. Wide access for ice cubes. Colour may vary, blue or red. Size 34.5cm high x 22.5cm diameter. Capacity 2 US gallons/7.6 litres. Suitable for both still and fizzy drinks. bought two of these as replacements for our old one which had become damaged. 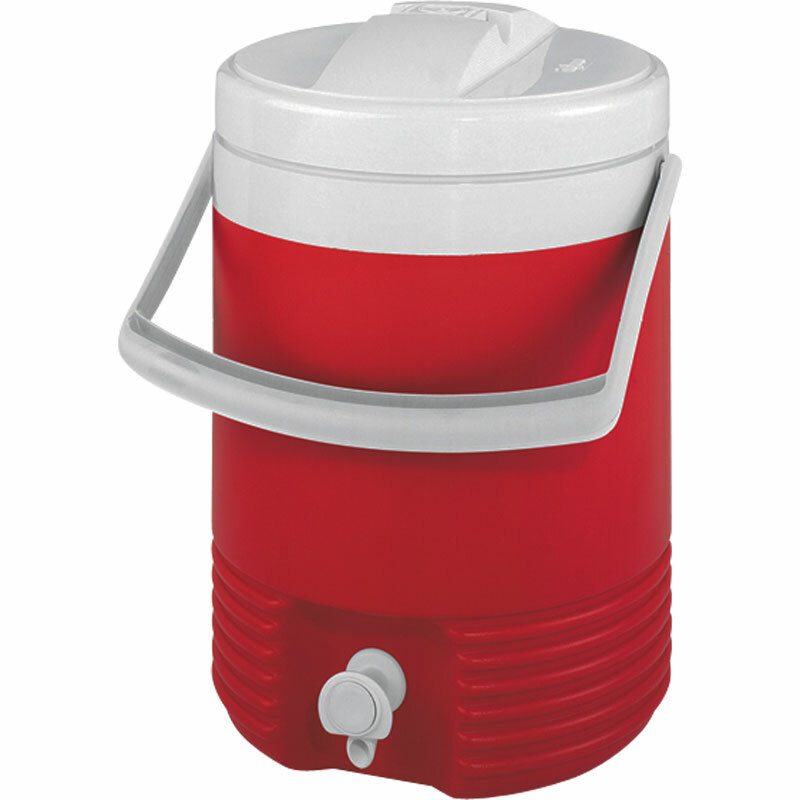 Great item perfect for keeping drinks flowing for Kids at camps and events. Fast delivery. Very good value for money. Have only used it a couple of times and think it's fab. Can't comment on how robust it is but it looks like it should last. Would thoroughly recommend it for the price I paid. This is a great product for youth group camp - filled it up in the morning and the children were able to help themselves to drinks all day. No messy spills as the taps can't be left on. Easy to clean, and insulated so kept squash cool all day. Thoroughly recommended - shame they don't come in different colours, for different flavoured squashes or squash / water options. Delivery was prompt too! Purchased 2 of these so children at school can self serve themselves during hot weather. Robust product. When I lived in Bermuda for 15 years, we used these coolers all the time. They remained cool on the boat all day long and served our fruit or rum punch ice cold during the hot, fatiguing day! This one is perfect! Great water container and dispenser for our motor home. keeps it fresh and easy to use when filling a kettle and so on. Very good sturdy drinks dispenser, should withstand a lot of heavy handed children using it. Only problem is that the lid is difficult to screw on. With a few minor modifications I am using this cooler as mini mash tun for small batch beer brewing. The cooler easily takes 1.5 kg of grain and water with enough head space to sparge. I am very pleased with this cooler, it was exactly what I wanted and keeps drink cold all day. The downside was that it took 5 weeks to be delivered, something that I wasn't told about, and therefore arrived at the end of the summer. During that time I had numerous emails from Newitts asking me to review a product I hadn't yet received . If not for this I would have given 5 stars. 5 out of 5 Just the job! I purchased 2 of these insulated containers to be used by children at a camp. They were used for ready diluted drinks and were fairly successful as children were able to operate the push button, they couldn't be left running and only produced minimal drips. However the lids weren't insulated which was a pity. Good strong product that had all the features (handle, press spout and vent) that we required. Easy to clean. A 3 gallon version would be a good addition to the range. Cooler is absolutely excellent! Managed to keep ice in it for approx 3-4 days! The way it was wrapped and packaged though unfortunately left a green transfer mark from the branded Newitts packaging tape which I can't remove from the white lid - otherwise I would have awarded 5 stars. The product definitely is, and the most competitive price on the net! we have used this for a BBQ, while camping, for workman during the heat wave and for my sons birthday party and each time it has worked brilliantly. Ideal for our bowling club to supply cold drinking water outside in the summer. A great way to distribute squash to thirsty children after school - highly recommended. The product is well made and sturdy. Delighted with this container. A big group of us going away this year. Looking forward to using it. Remember not the same as English gallons.